Royal Canin Neutered Junior Large is a tasty recipe expertly designed around the nutritional requirements of male & female neutered puppies. Tailor made to target the needs of larger breeds, this complete pet food provides your new four legged friend with total, balanced nutrition and helps your neutered pet to avoid problems commonly associated with the procedure such as weight gain and sensitive joints. 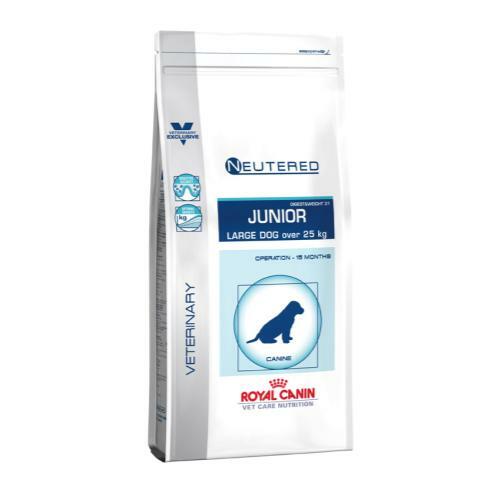 With calcium and phosphorus to support the skeleton and omega fatty acids for joint health, Neutered Junior Large helps to prevent issues that can arise in later life. Meanwhile, the delicious low calorie formulation is designed to satisfy your dog at meal times and is full of antioxidants to bolster your pet’s immune system and promote overall wellbeing. dehydrated poultry meat, maize, wheat gluten*, wheat flour, barley, rice, animal fats, dehydrated pork protein, hydrolysed animal proteins, beet pulp, minerals, vegetable fibres, soya oil, fish oil, fructo-oligo-saccharides, hydrolysed yeast (source of manno-oligo-saccharides), psyllium husks and seeds, hydrolysed crustaceans (source of glucosamine), marigold extract (source of lutein), hydrolysed cartilage (source of chondroitin). Vitamin A: 17400 IU, Vitamin D3: 1000 IU, E1 (Iron): 47 mg, E2 (Iodine): 3.9 mg, E4 (Copper): 9 mg, E5 (Manganese): 61 mg, E6 (Zinc): 184 mg, E8 (Selenium): 0.09 mg - Preservatives - Antioxidants.